Ethanol Production Resumes Record Pace; Bullish Crude? 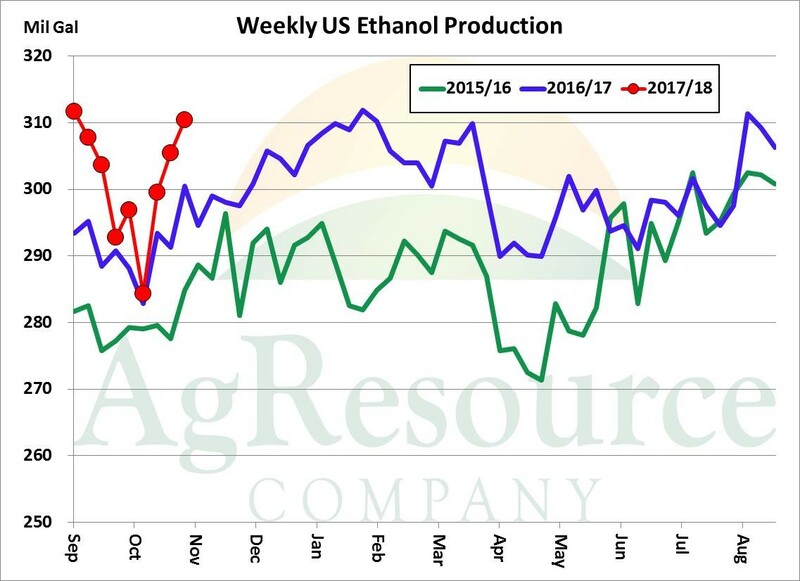 US ethanol plants through the week ending last Friday totaled 310.5 million gallons, up 5 million on the week and a healthy 10 million above the same week in 2016. Seasonal weakness in production occurred, as usual, in early fall, but the pace of US ethanol production has rebounded incredibly quickly. Production margins are up slightly this week, and there’s still no evidence to suggest any meaningful contraction in the months ahead. 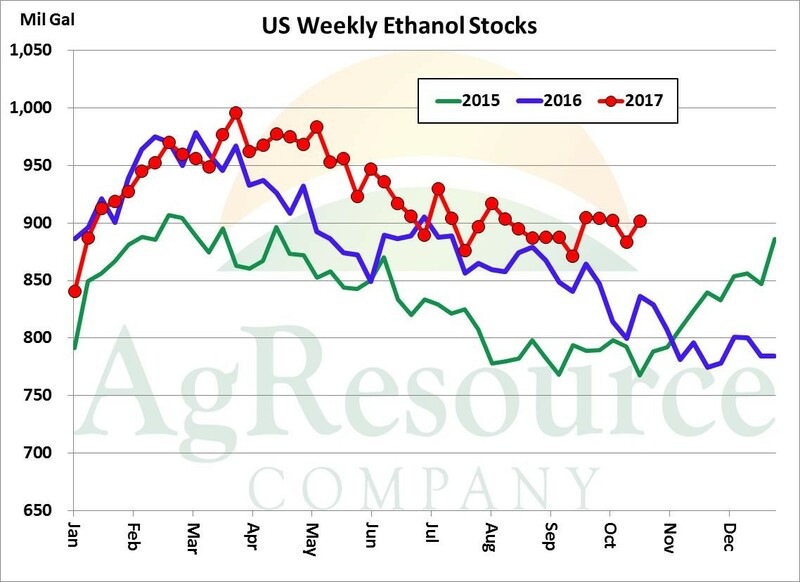 The US ethanol market remains strong. Stocks remain elevated, mostly due to record production, but further builds in stocks in the next few weeks are unlikely. US ethanol inventories last week totaled 902 million gallons, up 17 million on the previous week and up 9% from last year. ARC does mention, however, that lite export interest is ongoing, and gasoline futures have rallied 25 cents in the last 30 days, boosting incentive for discretionary blending, and the advance in gas prices makes fundamental sense. 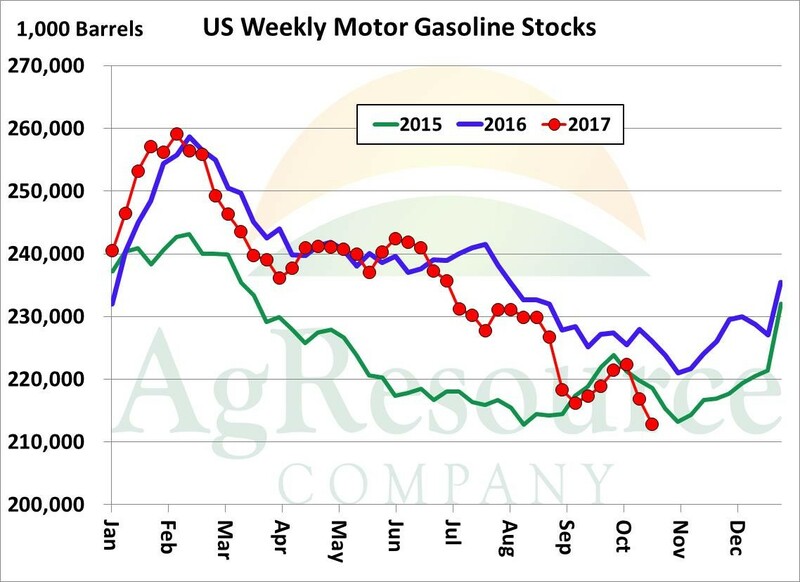 US motor gasoline inventories continue to erode, and of last Friday totaled just 213 million barrels, down 7 million from early October, down 5% from last year and the lowest since August of 2015. A very brief post-hurricane boost in supply occurred in Sep/early Oct, but the correction since has been steeper than expected. Even total US crude inventories are down 7% from last year, and that both gasoline and crude supplies are down is noteworthy. 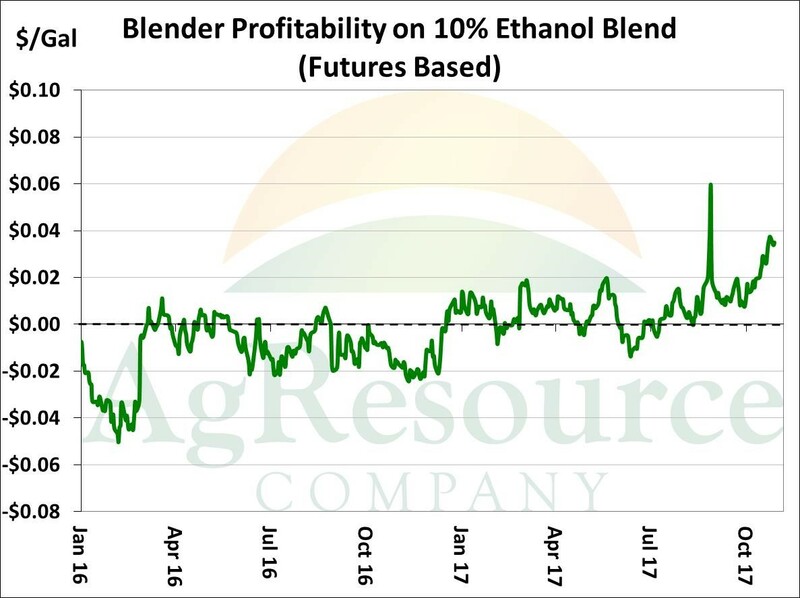 The future-based blend margin is displayed above, and aside from hurricane Harvey’s impact, current margins rest at the highest level in two years. The seasonal trend in domestic ethanol blending indicates steady consumption into late year, though higher blend use is forecast this year given current economics, followed by a lull in Jan/Feb. Notice that blend margins a year ago were negative, and at times substantially so. And could the rally in energy prices have a more lasting effect on commodity markets as a whole? Higher crude prices should strengthen currencies in Russia and Canada, and across the Mid-East, which would be a positive for grain demand. Commodity indexes, too, are showing signs of strength, with the CRB higher for a second consecutive month.